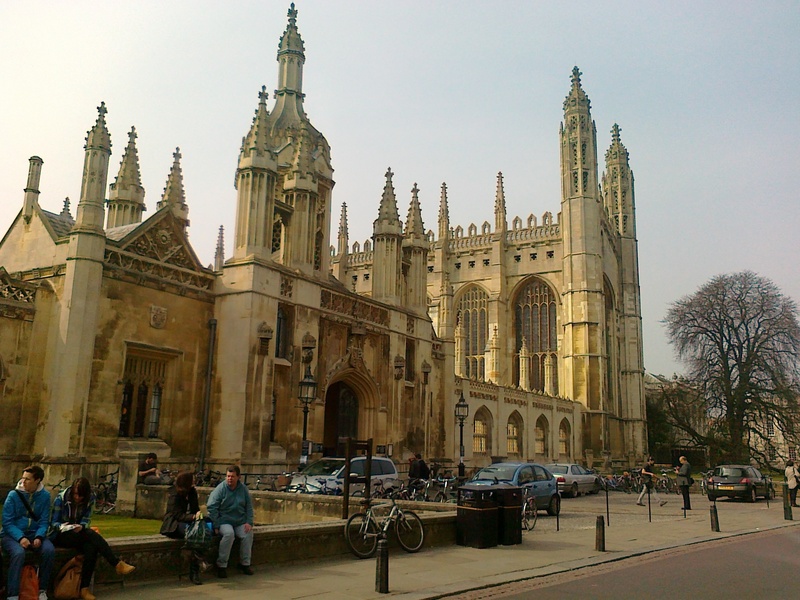 The University of Cambridge is one of the highest ranking and most famous universities in the world. It is rich, eccentric, and somehow archaic and cutting edge at the same time. But the many tourists who flood into the city each year may be surprised to discover there is no central building or group of buildings which you can point at and say 'there it is!'. Rather, the University is composed of 31 colleges, each semi-autonomous, which are scattered across the city (and beyond) so that it would be impossible to see them all in one day. People generally want to see the most well-known, most beautiful, and most grand, and King's College definitely meets these criteria. The main entrance on King's Parade consists of an archway set into a spire-topped stone wall that resembles a mini Taj Mahal. The imposing structure of King's College Chapel looms to the right, a stunning example of late Gothic architecture and one of the iconic sights of Cambridge. It is topped by four 150 foot spires, which, in November 2009, were each adorned with a Santa hat after a group of anonymous students climbed unaided to the top during the night in order to place them there. Although various objects have been put on the spires by adventurous (or foolhardy) students over the Chapel's 500-year history, that was believed to be the first time ever something was placed on all four spires at once. The College called in a professional steeplejack, as they were keen to have the hats removed before images of the Chapel were broadcast across the country for Carols from King's. You'll be given a leaflet on the way in to the College which will guide you around the grounds and point out certain interesting features such as the fountain statue of 'boy king' Henry VI. It is certainly worth seeing all this while strolling across to the river, especially in good weather, but the Chapel is really what a visit to King's is all about. Inside the Chapel the first thing that will probably draw your attention is the extensive and captivating use of stained glass. The soft coloured light gently illuminates a grand ante-chapel with an intricate stone ceiling, and a large oak screen which separates the chapel's two halves and houses the organ. This screen is one of the main features of interest and was constructed by Henry VIII as a celebration of his union with his new wife, Anne Boleyn. As the leaflet informs you with an unintended hint of grim humour, this dates it to between 1533, when he married her, and 1536, when he executed her. It is decorated with their initials – you will easily spot the many 'HR's for Henry, but the 'AR's for Anne, and the single 'HA' representing both of them, are a bit harder to find (to give you a hint, all of them are on the higher section of the screen). The screen also represents the divide between the world of the everyday and the world of heaven: all the symbols on the ante-chapel side are linked with life at the King's court, whereas the symbols on the other side are all about glorifying God. 'The Adoration of the Magi' by Rubens, painted in 1634, sits above the altar. The various small side-chapels are worth investigating. The door to the right of the altar takes you into a small chapel which lists King's scholars who died in the World Wars. This includes the poet, Rupert Brooke, and, interestingly, a Hungarian who fought for the Germans whose name is separate from the rest on the pillar by the door. The door to the left of the altar takes you into a small but well-conceived exhibition about the Chapel's history. In addition to information about the involvement of various kings over the ages, it includes architectural models showing how vaulting is constructed, and pieces showing you how stained glass is made. If you're going to visit one college in Cambridge it probably has to be King's, mainly because you can't really miss it: the Chapel stands as a majestic tourist-beacon right in the heart of the city. However, it is the most expensive college to visit, so if you want to save some pounds wander further down towards Clare, Trinity or St John's. The only thing I don't really recommend is going for a climb - even if you happen to be carrying a spare Santa hat or two. Why? To see inside the most beautiful building in Cambridge, but ideally not to climb it.